Earlier this year I started using Shiseido Benefique to very happy effect. I'm still using it daily so when Shiseido reached out to ask whether I'd like to try out the Shiseido Benefique Advanced masks, I was like YES. My skin tends to dry out quickly when the temperature drops so I'm on board with hydration treatments! I wanted to share about the mask for this week's Friday Find, and also, I'm giving away a set of masks to a lucky reader. Yay! The Shiseido masks are soft -- similar in weight to a baby wipe -- and are infused with an intensive cream composed of brightening and anti-aging ingredients that promote cell turnover. After your regular skin care routine, just apply the mask for 10 minutes (they recommend once a week) -- it's easy and not super messy. And while yes, I looked somewhat scary with the mask on (I texted a few of my sisters a rather terrifying selfie! ), it felt SO GOOD! The best way I can describe it is that I had that feeling I have after a facial, where my skin is super moisturized and dewy looking. It felt so good, in fact, that I squeezed all the remaining essence out of the mask and mask bag and rubbed it all over my neck. Ahhh. 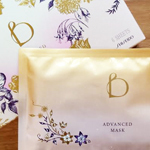 A six-pack of masks retails at $85, which may seem a little spendy, but a $14 hydrating treatment is a nice option if you don't have the time/money to get to a spa for a full facial. And some super good news? I've got a six-pack of masks to give away to one of you fine readers! Just enter via one or both of the methods below via the Rafflecopter widget. Entrants must reside in the US. Good luck!